What is the musical philosophy behind It’s A Fine Line? Are there any strict rules to the music It’s A Fine Line covers? IS: There may be unconscious rules but, ideally, they are made to be bent. Then again, there are things we won’t play- Like a bad record! TP: Yes there might be only one rule: To be genuine. It’s not so much a question of what record you play but how you tell your story. Which It’s A Fine Line parties have been highlights so far? Have any particular tracks become It’s A Fine Line classics’? IS: Quite a few but you will have to come. Will only give out one as you seem like nice people (and we have been hammering it to death now): the Anthony Rother remix of Voice Modulation by Aux 88. TP: And The Pete Herbert edit of The Swiss was one of our regular finishers too. How did you and Tim meet each other and how did lead on to the creation of ‘It’s A Fine Line’? IS: We have known each other for years in Paris. IAFL came about when we both realised we were exiled in London. What’s your view on the current state of London clubbing? IS: It is not bad, better than a couple of years ago even if ‘niche conformism’ (electronic bigotry, small style/small mind) is always a danger, especially under the guise of being ‘open-minded’. I would not say London has the best clubs in the world, but it still is the best city. TP: It looks like it’s becoming the centre of Europe at the moment, so may parties listed every weekends, it’s insane…but great! Personally I had all my best 2012 parties in London so far! What do you think of the so-called rise of small and mid-sized clubs in London and how do you think this had impacted on the music being heard in the capital? TP: Big sized clubs weren’t economically viable, they closed and now people organise smaller parties with less risks. I don’t really see any impact in the music being heard. London always offers an incredibly wide range of music styles (and not only electronic), it’s one of the main reason I moved here actually. It’s A Fine Line will be making a voyage south of the river, is this the first time it has done so? How would describe It’s A Fine Line to someone who had never attended an event? IS: Something to go and check. 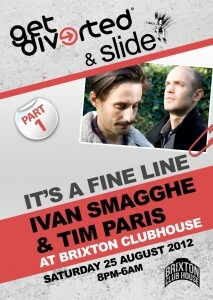 What can Slide expect for this Saturday? TP: Yes exactly, we tend to be as eclectic in our performances as in our productions, best thing is to come and share the music with us! 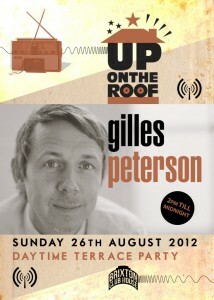 As well as Ivan Smagghe and Tim Paris on the Saturday night… Sunday daytime also sees “Up on the Roof” bringing Gilles Peterson to Brixton Clubhouse for a daytime soiree – and wait! 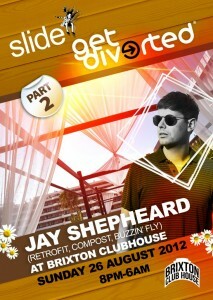 If this wasn’t enough Slide and Get Diverted are back again on the Sunday night with Jay Shepheard from Berlin! We have a bumper weekend ticket up for grabs which gets you and a pal entry to all THREE events this bank hol! Massive! all you need to do to enter is mail: melissa@plainandsimple.tv and tell us why you should get the ticket!! Exclusive Interview With Clive Henry AND A Chance To Win VIP Tickets AND Vodka @ PWP PACHA London!